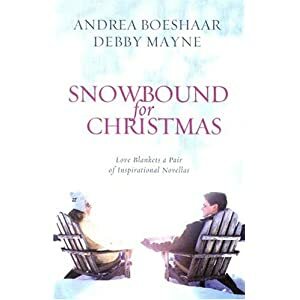 These paired novellas, from Debby Mayne and award-winning author Andrea Boeshaar, celebrate Christmas surprises—and make for a perfect winter read. Follow Shari Flannering, driving through a storm and stopping at the inn of old family friends—only to be greeted at the door by the man whose heart she broke twenty-three years ago. Watch Kathryn Anderson, stuck in New York City for Christmas, minding her aunt’s city house and tending to guests—when mounds of snow shut down streets, she may find love residing right under her nose. Will Shari and Kathryn soon be thanking God for the snow or praying for an early thaw? This was a delightful pair of novellas wrapped up in romance and festive cheer. If you are looking for a quick, fun, festive Christmas read then this will be a sure-fire hit. Whose heart does not turn to Christmas romance as we sit by the blazing fire or by twinkling Christmas tree lights and think of days gone by or hopeful days to come? Both novellas center around the idea of being snowbound with a potential suitor. Being forced in the same space with one another, irresistible desires are fanned into flames as each heroine and hero decide whether or not to act or let love fleetingly pass. Will the short time of being stranded together by the weather be enough time for each of these couples to explore love? The first novella centers around Shari Flannering who opts to take cover during a snow storm at the Open Door Inn. Once there she encounters her former fiancee from twenty years earlier – the extremely attractive and successful Dr. Brenan Sheppard. Shari got away once before, but Brenan is hoping she won’t the second time around. The second novella takes us into the life of aspiring chef Kathryn Anderson who takes on her ailing aunt’s boarding house in Soho. Giving up a chance at an internship at a famous restaurant in Florida, Kathryn decides to help her aunt whom has always been there for her when her parents were not. While learning the ropes of running a boarding house and cooking “ordinary” meals for the tenants, she meets an attractive man of faith with a questionable past. Will she be able to get past the multitude of hurts from her irresponsible parents and learn to love Stan before their paths take them away from one another?